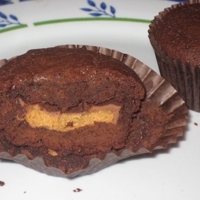 A decadent brownie cupcake with a Reese's Peanut Butter cup baked inside! Preheat oven to 175Â°C (350Â°F). Line a standard size muffin tin with cupcake liners. Melt the chocolate and butter by placing in a large heatproof bowl or a double boiler, and setting over a pan of simmering water. Stir occasionally just until melted, it takes about 5 minutes. Remove bowl from heat. Whisk in sugar and salt until mixture is smooth; whisk in eggs to combine. Gently whisk in flour and cocoa, just until smooth (do not overmix). Spoon 1 heaping tablespoon of batter into each cup. Place 1 peanut butter cup on top, gently pressing into the batter. Top with 2 more tablespoons of batter, covering the peanut butter cup completely. Bake for about 35 minutes, rotating halfway through, and until a cake tester inserted halfway in centers (above peanut butter cup) comes out with a few moist crumbs attached. Cool on wire rack. Cupcakes can be stored up to 3 days in an airtight container at room temperature. This recipe looks awesome! Can't wait to try! I'm trying these tonight! My mom loves peanut butter cups and it's her birthday tomorrow so wish me luck they sound yum!! here in spain i don't think we have ''reese's peanut butter cups''... do you think i can fill them just with peanut butter?